Celebrate good times c’mon! This is my second time of trying TC’s Celebration Ale. The first time was a bottom-of -the barrel job, looking like so much like Ganges water I half expected a blind dolphin to jump out of it. Not so this time round. 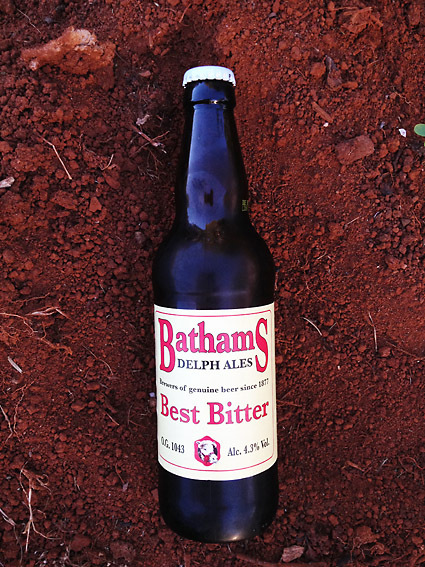 Visits from second cousins deserve a trip to the Eltham Pub, for award winning grub and great Aussie beers, served in great British pint glasses. This is a very easy drinking beer, yeasty, with plenty of fizz, slight caramel undertones and mild bitter finish, it seems to disappear very quickly. I kid you not, but upon swallowing, the ale seems to lose all mass ….. it goes down, “just like that”. I was really looking forward to trying Little Creatures’ Rogers’ Beer, not least because of their wonderful Pale Ale. 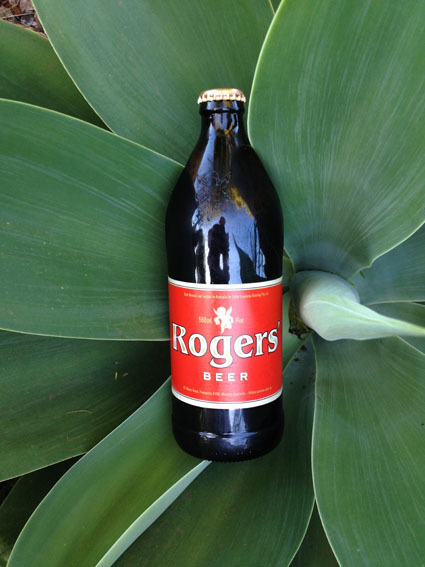 Being available in a pint bottle certainly had its attractions too, ‘cos I’m only allowed one beer a day ……..
Rogers’ Beer by Little Creatures. 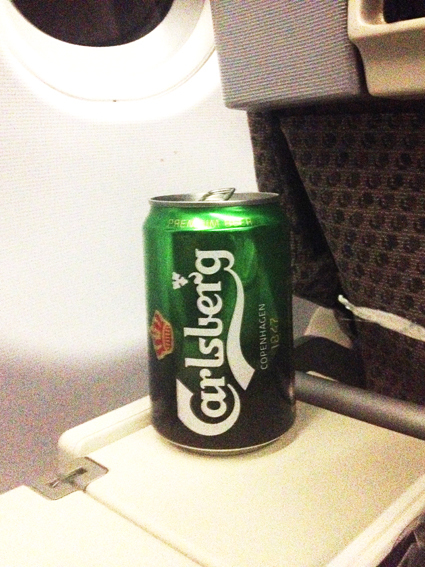 Easy drinking made easy. By now I should have learnt to manage my expectations as this was a little disappointing. Dark amber in colour, there’s hints of toffee on the nose but I wanted more ‘umph!’ on the palate. It’s quite sweet, with a citrus undertone, so much so that it tastes a bit like a shandy. Easy drinking certainly, but a little too easy for my liking. 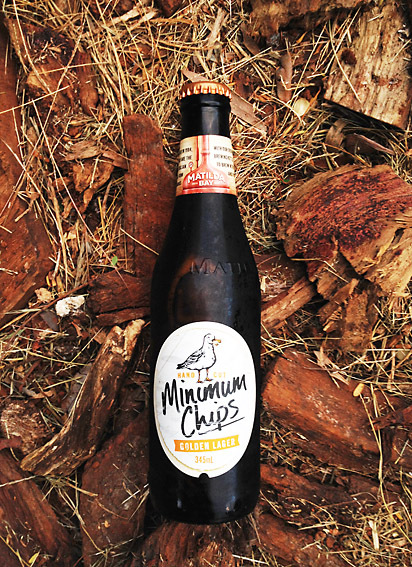 Now I’m a big fan of Matilda Bay, ‘Fat Yak‘ and ‘Redback‘ being two of my favourite Aussie beers, but I found the ‘Minimum Chips’ left me a bit cold. It’s quite fruity on the nose and it’s certainly a lovely golden colour but, like many lagers, it lacks the depth of a real beer. Perhaps I should stay away from lagers for a while. Don’t get me wrong, this is not a bad lager, there’s a malty sweetness to it, balanced with a bitter finish and I imagine, when it’s really cold, it would be a good accompaniment to hot, salty chips. But for now, I leave this one to the seagulls. Having to wait for a table at the Moroccan Soup Bar, in North Fitzroy can have its advantages, like having a cheeky beer at the Monkey, next door. 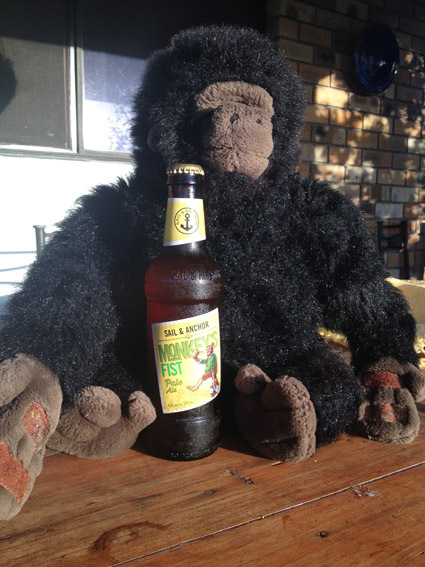 The very funky ‘Monkey’ serves a fine selection of craft beers and I was drawn to the vintage label of the Hawthorn Premium Pale Ale. Served to a soundtrack of late 60’s reggae and Marvin Gaye, this is a very unique style of pale ale. Shiny bronze in colour with a complex floral aroma, we couldn’t decide (I had a tasting panel of 3 on this one) wether it was a Summer or Winter ale or something in between (i.e. 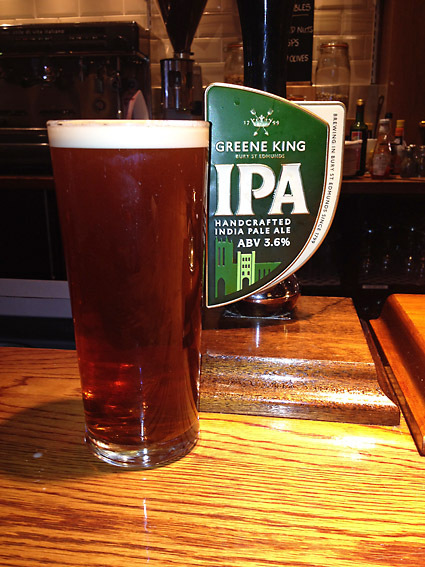 a Spring or Autumn ale as suggested by my wise-cracking niece …… fair point). Whatever season you chose to drink this ale, I’m sure you’d find it very satisfying. Not as fruity as you average pale, its taste develops as it slides over your tongue, hints of citrus rind, limes with an acetone undertone ™ (I’m trademarking that one). 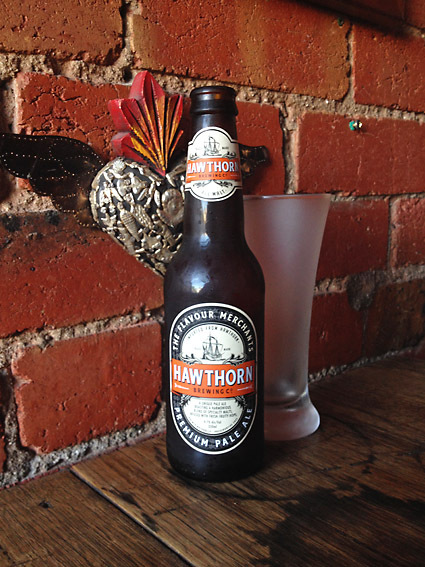 Ultimately refreshing and intriguing ….. and it’s been imported all the way from Hawthorn! Also highly recommended is the special banquet at the Moroccan Soup Bar. An array of gorgeous vegetarian dips, salads, tagines, and sweets, washed down with mint tea … all for $25. No wonder there’s a waiting list to sit down. In honour of the vinyl spinning at the ‘Monkey’, here’s Marvin Gaye withy ‘Let’s Get It On’ ….. listen to crackles in the background. 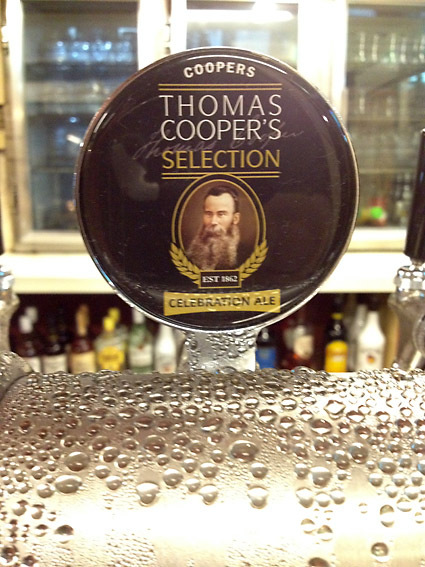 When in Rome …….. Well, when in Melbourne do as the Melbournians do. 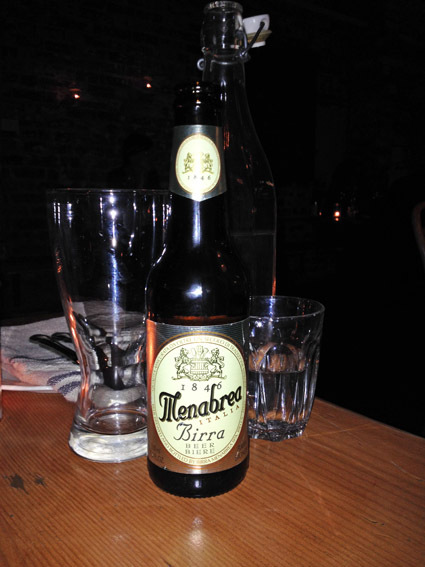 Last night I tasted an Menabrea 1846 in the wonderful ‘East Elevation‘ restaurant on Lygon St. 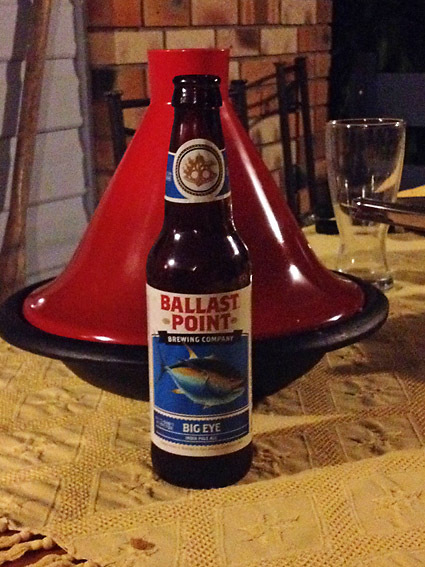 This Italian lager is pale gold in colour with a hint of honey on the nose. This sweet aroma is reflected in the taste, southern European in style, it is smoother than its northern European cousins. I’m a little behind in my blogging but not in my tastings, so I’m going to double up on a few occasions. Here’s another nautical knot-themed beer from Fremantle’s Sail & Anchor brewery. A ‘monkeys fist’ is a complex knot that is tied in the end of rope to make a ball, adding weight and making the rope suitable for throwing, usually from one ship to another. My mate, Nathan actually tied one once! I have to say, I was a little disappointed with this beer. As a fan of pale ales, I was expecting more from Sail & Anchor. Yes, it’s fruity, yes there’s a bitter finish but something’s missing? It didn’t really pack the punch that it promised …. or has my palate been spoilt by hearty British ale? Here’s Spiritualized with ‘I Think I’m In Love’ ……. you’ll ‘probably’ get it when you hear the lyrics. The video is quite apt!